Using Cosmic Cocktails & Catering to cater for Ben’s 21st on Saturday night was the best decision we made. The whole Cosmic experience from start to finish was fantastic. Your web site allowed me to view your services fully and the customer feedback gave me the confidence to use your services. The food was delicious – we had many, many good comments from our guests. The wait staff Bronte and Hannah (I apologise if I have their names wrong) were very professional and just got on with their job – I did not have to worry at all. Please also pass on my thanks to Catherine – she was such a big help from our initial discussions to choosing platters to delivery details. Once we get the photos I will post some with our comments on your facebook page. We would just like to thank you very much for all that you did for us for our New Years Eve party. The cocktails were a hit and the food was incredible. We got a lot of compliments for both. Thank you to the gentlemen who dropped off and set up they were wonderful. We were thrilled with the quality of the food and drinks as well as the professionalism of all of the staff we dealt with. Thank you so much, we will definitely use you for future functions. Wishing you a prosperous 2014 full of laughter and happiness. I just wanted to thank you and the staff at Cosmic. The food was delicious and delivered perfectly on time. Thanks so much, I had a really wonderful night and so did all our guests. I'm pretty sure that you'll be getting some more business ;-) Rhiannon and Jess did an outstanding job and everyone was impressed. If you would like any more testimonials, we'd be delighted to provide ours. The night was a long time in the making and I appreciate all your help and patience. Thanks so much for helping to make our 50th party great with the fab food on Saturday.I cannot tell you what a relief it was to not have to worry about food. I am also very grateful that you could deliver late so we could fill our fridge with drinks on such a hot night. The food was fantastic. I am very happy to be a reference if you need one. Just wanted to say as always the food was excellent. There was very little left and I am sure it will all be gone by the end of the day. Hey this is Sarah Harris. I had a party on the 5th of October and hired a 3 bowl slushy machine and a juke box with karaoke, and I just want to say.. Thank you so much! Everyone loved the karaoke! The alcoholic slushies! And despite being upset about my 9 week old puppy getting stolen, the party was awesome and I had a blast celebrating turning 21 with all my friends! It was great. So thanks again! Everything was wonderful. They loved the chutney and everyone commented on how tasty everything was. Dear Tanya, Clint and Catherine………thanks so much for such a superb spread for our luncheon today. It is was beautifully presented and extremely varied and tasty. We appreciated your courtesy and efficient service. I certainly won’t hesitate to recommending Cosmic Cocktails & Catering to anyone I come across looking for a caterer. Just thought i would email you and give you some feedback. The food was amazing and I was complimented all night about how good it was! It was so delicious and everyone loved it. The 2 staff members (Jess & Chrianna) were also fabulous and so very helpful with everything! Would definitely recommend Cosmic Cocktails & Catering, amazing work, thanks again for everything!. Lunch was fantastic. Thank you very much. Everyone loved it. A job well done for us. I just thought I should send you a vote of thanks for Cosmic Cocktails & Catering last night. Claire, Ingrid and I really appreciated the effort you and your staff put in last night. It was fantastic. All our guests enjoyed the drinks and the food. Your staff were also excellent and I would be pleased if you would thank them for us. The girls came back inside to wish Claire a happy 21st which also was really appreciated. Best wishes for your future successes. Thank you Catherine and the team at Cosmic Cocktails & Catering for providing catering at our Art Awards Opening Night on Friday. We had great feedback about the food and friendly service and all your efforts were very much appreciated on the night. Thanks again for the chocolate fountains last night – who would have thought that we would have had such an overwhelming response! I just wanted to get in touch to say a massive thank you to you and Sam for doing such an amazing job last night with the chocolate fountains. I think it was easy to see that everyone loved them and had no hesitation in really getting stuck in to them. It was an absolute pleasure to work with you on the run up to the event and then meeting you on the evening. I thank you so very much for your help, efficiency and delightful personality. It was such a pleasure talking to you on Friday. I wanted to thank you for the food last the week-end. It was DELICIOUS! Our guests raved!!! Thanks very much for the catering yesterday the food was wonderful and we received many positive comments. My partner (Jakub Chudy) and I had our engagement party last Saturday the 19th January and we chose Cosmic Cocktails & Catering to cater it (we bought platters and hired two waitresses). We just wanted to say thank you for the great service, the food was wonderful and the waitresses were great. It really took a huge amount of stress away knowing that all the food was being organised and that we didn't have to worry. One waitress we had I particularly wanted to mention, her name was Aleisha and she was absolutely amazing. She did such a great job, I showed her where a couple of things were at the start of the night and turned the oven on and that was all I had to do, she had absolutely everything covered and did an awesome job at keeping the food coming at an appropriate pace. She also set my own chocolate fountain up with no troubles and when she was finished with the food offered to help with drinks/tidying. We wanted you to know what an asset she is to your staff. Thanks again for helping so much with our engagement party! Thanks so much Cosmic Cocktails & Catering for catering my function last night. 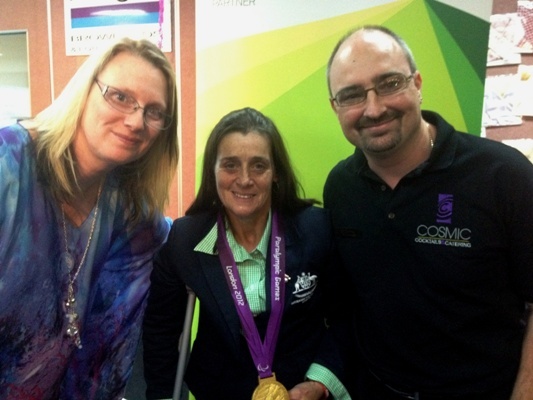 It was a big event for me, as WA winner of the Telstra Go For Business Gold award, and our VIP guest, London gold medal paralympian Joann Formosa especially commented on how nice the food was as did other guests. As a coeliac, it was a rare treat to have full platters of beautiful food that I could eat everything. Well done, and thanks again! I'd like to say a huge thank you to Clint of Cosmic Cocktails & Catering. He did a fabulous job at my husbands 40th on Saturday night and the food was fantastic. Thank you so much for the beautiful platters. Everyone enjoyed the food and it certainly made our lives easier. Many thanks for the great cocktails on Saturday night - the compliments still keep coming in to us from friends and family who enjoyed the party and said that the cocktails were a real treat and really help make the event, not just good but a great party !! I am still amazed by the number who enjoyed the Toblerone!!! So you really won that one. Even Scott had a few of them I hear. Friends have complimented you on the service and quality of the cocktails and Scott and I were both delighted. Thank you so much for getting the event arranged at quite late notice - I am really glad I decided to go with the idea as it fitted the Gilligans Island fun just perfectly ! Many thanks and please compliment your staff too. I wanted to email you straightaway to thank you for a wonderful cocktail party. You have been great to deal with all the way through, and made everything so easy and enjoyable. It was very exciting in the morning to see the bar area set up, I can see you have done that many times before and have got it down to a fine art. The Cosmic Cocktail Staff for the evening, Dan, Debbie and Anthony, were a pleasure to have. Very professional, but at the same time approachable and accommodating, the evening just flowed without a hitch. And of course, one of the best bits, no cleaning up. Everything was cleaned up and packed away, as if they had never been there, apart of course from the jugs of cocktails left for us, a lovely touch. I know everyone that attended our party, were extremely impressed with the evening provided by Cosmic Cocktails, and I will happily recommend your services. Just a note to say a big thank you for all your help with the platters since I had left it so late to order and also my chocolate gift. The platters were excellent. I was extremely pleased with the service right from the beginning when I first spoke to you along with the lady who delivered them. You were both so friendly and helpful. Nothing seemed to much trouble. You are both a wonderful asset for Cosmic Cocktails & Catering and I would be happy to order again. Thank you Catherine for making the process an easy one. Cosmic Cocktails provided a delicious variety of Asian and Vegetarian hot platters and an amazing chocolate fountain for my 40th birthday party. Clint's presence on the night meant everything ran like clockwork and the pressure was off me so I could simply enjoy the party. Many guests commented on both the yummy food and the the high quality of service provided. It was an excellent night and Cosmic Cocktails was a large part of the event's success. Thank you very,very much and I look forward to booking you again for future functions. Thank you for all your help, you went above and beyond our expectations. Megan was very helpful and we would happily have her as a waitress again at any future events. It has been an absolute pleasure dealing with you, your company is very lucky to have such a wonderful employee. for the awesome service you provided with the Cocktail machine for our wedding. What a pleasure to have dealt with your Company and we will definitely be recommending you and we will have no hesitation in using Cosmic Cocktails again. We recently hired Cosmic Cocktails to provide us with a 3 bowl frozen cocktail machine and platters for our 40th birthday party. I just want to say a huge thanks. Everything was fantastic. The service provided by Cosmic Cocktails was unbelievable from our initial email contact, through to telephone contact and the delivery/collection staff. It was a pleasure to deal with Cosmic. Our party was an absolute blast and we wouldn't hesitate to recommend your services to anyone. We would definitely utilise Cosmic Cocktails again. I would like to thank you and your Team for a most successful evening. My guests were really impressed !!!!!! Clint thank you for arranging the Cup Cakes and Red Carpet. Look forward to doing business with you in the future. A party or celebration in our family would not be complete without a Cosmic Cocktail slushy machine. We really appreciate the range of flavours (alcoholic and non-alcoholic) but more especially the great service you have provided us on all occasions, which I think now, is five - 50th birthday celebrations, 21st birthday parties, pre-Ball drinks and graduation knees up. Many thanks for a great addition to the party and without dramas. Thank you Clint and the girls for a wonderful evening of cocktails and canapés. All our guests to our engagement had a wonderful time and couldn't praise the girl's service enough. I would like to say a huge THANKYOU to Clint and his wonderful, wonderful staff who contributed to the excellent time myself, my partner and our guests had at our engagement party on the 16/01/2010. Our guests are still commenting on the top quality of the food and service on the night. Thankyou for helping to make our special night one we will never forget!Please pass on our gratitude to Clint and the two girls (I have forgotten their names) who took care of the food and our troublesome drinks fountain. Just a short note to say thanks so much for the lovely food and for the prompt service at picking up all the boxes the very next day...For the first time in years I was actually able to enjoy our family function which was my daughters 21st everyone had a lovely time and the kitchen was left very tidy and clean by Kylie, we had more than enough food maybe too much I think I over ordered. I spoke to Clint about a function later in the month of October. Thanks again will be in touch very soon and will most definitely recommend you for future functions to my friend's a great night was had by all, so much easier. First up, I would like to thank Cosmic Cocktails & Catering ‘Cosmic Cocktails', for providing an efficient Bar, with a quality range of alcoholic and non alcoholic drinks, plus ice, glasses etc.Supplying us with an essential service to our 224 guests, on 18th October 2008, the dinner being the final celebration of the championships. You and your staffs in attendance were co-operative and helpful to everyone, in particular supportive to me, who had to keep the organization of the evening sailing along.For us, the Dinner organization was not a simple project we had to achieve, however, after contact with you until its completion, every assistance was given to us from you, thus we had a successful evening. A special ‘Thank You' from Pam. We would be happy to recommend and put forward the ‘Cosmic Cocktail' company to anyone requiring quality Drinks Service, together with co-operative Staff for their function catering requirements. Wanted to thank you very much for helping us make our Wedding Day celebrations on 13-01-2007 such a memorable day. 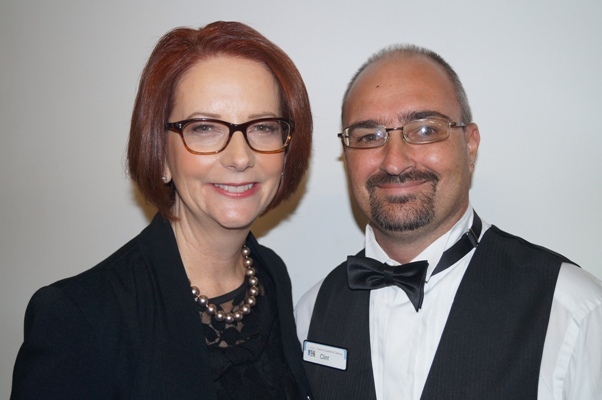 Trev and I, as well as all of our guests, have nothing but the utmost praise for the service you and your staff provided us during our cocktail reception. All of our guests reckoned it was the best, most relaxed and fun wedding reception they had ever been to - and the bride and groom go along with that! From the lead-up preparation, to your beautifully delicious food and the way it was presented, to the scrummy cocktails (of which we and the guests seemed to REALLY enjoy!!!! ), to the service of you and your staff on the night (and even the cleaning up afterwards), was simply FIRST CLASS. Highly recommended. We cannot thank you enough. Everyone that was at the party had a great night and many of them are telling me that it is the best bash they have been to. Sue and I would like to pass on our thanks to all the team at Cosmic Cocktails, and we will be in touch for the next one. 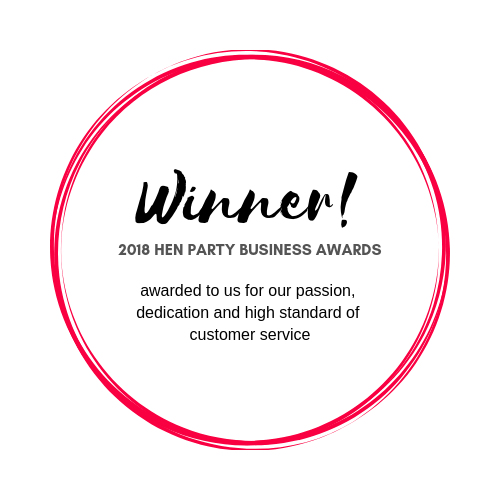 Just a quick email to say a big thank you for our Hen's function on Saturday night. Your bar staff where amazing and should be commended for their friendly attitude. I spoke to a few of the girls the next day and they all commented on how excellent the cocktails where and how nice the staff were. I will be definitely be recommending you to other people that are interested in cocktail parties in the future. 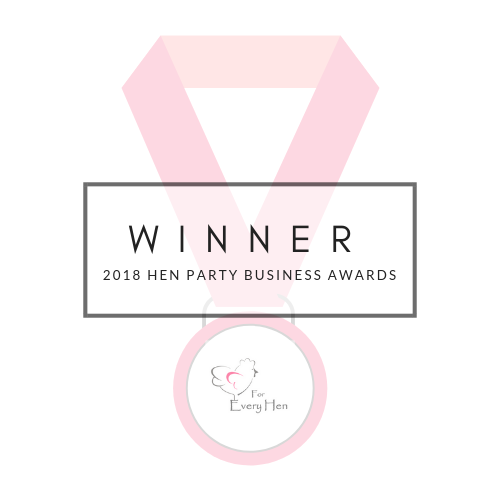 Once again, thank you for making it such a memorable Hen's party ( maybe not for the bride! hee hee). I would like to say thankyou for your generous donation from your business to the Nedlands Primary School Fundraiser "Soiree by the Swan" on 17th June 2006. It was a wonderful evening at the Perth Flying Squadron Yacht Club attended by over 140 people and raised over $17 000. This will go towards our current project which is upgrading the undercover area/ performing arts centre. Clint and Tanya it was wonderful to have you help on the evening with your generosity. Thank you so much for doing my hens night on the 03/10/2009. You both did a fantastic job and I have had nothing but positive comments about the professional friendly manner that was provided all night along with the set up and service you provided from everyone that attended. You really did help make it a night to remember and were so fast and efficient all night. Your girls did a great job at my Hen's last Saturday!!! The cocktails were great and the girls were efficient which made the day stress free for me. We all loved it so well done. I would definitely consider it again if we had a party. Although, my only suggestion would be to update the cocktail range - some of them were so sweet!!! But I guess that's a personal preference. Anyway, thanks again and well done!! I once more wanted to say thank you for the excellent service your company has provided us on our wedding day. Thank you for the continuous communication, we knew what was happening at all times, and for the food you provided us with. It looked and tasted great and was a big part of what made our reception a success. Our guests enjoyed it thoroughly. If needed,we will definitely make use of your company in the future. On Saturday you did the catering for our daughter, Isobel's wedding. As her family we want to thank you for your outstanding service. Our guests enjoyed the variety and all agreed that the food was good. Thank you for helping to make a success of such a special day.